The Aérospatiale SA 315B Lama is a French single-engined helicopter developed to meet hot and high operational requirements of the Indian Armed Forces. It combines the lighter Aérospatiale Alouette II airframe with Alouette III components and powerplant. The Lama possesses exceptional high altitude performance; on 21 June 1972, the type established a helicopter absolute altitude record of 12,442 m (40,814 ft), a record which remained unbroken as of September 2017. On 17 March 1969, the first SA 315B, powered by an Artouste IIB engine, undertook its maiden flight. On 30 September 1970, the type received its airworthiness certificate, and it was introduced to operational service in July 1971. Due to its favourable high altitude performance, the Lama quickly became popular with operators worldwide, often being deployed within mountainous environments. As with the Alouette series, the type can be fitted for various roles, such as light passenger transport, agricultural tasks, oil-and-gas exploration, aerial firefighting, and other specialised duties. The military variants of the Lama include liaison, observation, photography, air/sea rescue, transport and ambulance duties. The SA315B is particularly suited to mountainous areas due to its performance and can carry underslung loads of up to 1000 kg (2,205 lb). By December 1976, 191 Lamas had been ordered by 68 operators. A significant number[clarification needed] of SA 315B Lamas were manufactured under license in India by Hindustan Aeronautics Limited (HAL), under the name Cheetah. More than three decades after production in India began, HAL was still receiving export orders for the original Cheetah. Along with the Alouette III, the Cheetah was a key product for HAL; experience from manufacturing the type aided in the later development of more advanced indigenous helicopters such as the HAL Dhruv. During the 1990s, HAL developed an armed light attack helicopter based upon the Cheetah, which was given the name Lancer. In 2006, HAL proposed a modernised variant to the Indian Army, designated as Cheetal, the principal change of which was the adoption of a modern, more powerful Turbomeca TM 333-2M2 powerplant in the place of the Artouste; HAL promoting the Cheetal's capabilities for operating in high altitude environments, such as the Siachen Glacier. Other improvements include new warning indicates, a cockpit voice recorder, flight monitoring system, artificial horizon, and modernised electronics. In 2006, an initial 10 Cheetals were ordered by the Indian Air Force. In February 2013, it was announced that the Indian and Nepalese Armies had signed a 300 crore (~US$55 million) contract for the urgent procurement of a further 20 Cheetals. 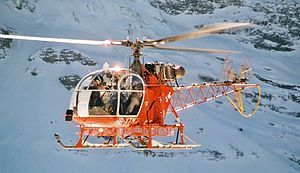 During 1969, a series of early demonstration flights involving the SA315B were performed in the Himalayas; during one such flight, a single rotorcraft carrying a crew of two and 120 kg of fuel landed and then took off at what was then the highest altitude to be recorded, 7,500 m (24,605 ft). On 21 June 1972, a Lama with a single pilot (Jean Boulet) aboard established a helicopter absolute altitude record of 12,442 m (40,814 ft), a record which still stands as of December 2018. During the same flight, the Lama's engine flamed out at the peak altitude of the flight, which led to an inadvertent record being set for the longest ever autorotation after which the rotorcraft was brought to a safe unpowered landing. Days before, the same pilot and aircraft had set a similar record at a higher weight. In addition to India, other countries have participated in licence production activities. In 1978, an export agreement was reached with Brazilian aircraft manufacturer Helibras, under which it would perform domestic assembly of the Lama. Such Helibras-produced SA 315Bs were marketed under the designation Gavião; several examples of which were successfully exported to neighboring Bolivia. ^ a b c d e f g h i Robinson, Skip. "The Mountain King." Vertical, 17 November 2016. ^ "Aérospatiale SE 313B Alouette II." Flight International, 17 July 1975. p. 84. ^ "SA.315B Lama." Flight International, 27 November 1976. p. 1589. ^ a b "HAL bags $10 mn order for Chetak, Cheetah from Namibia." Economic Times, 10 June 2009. ^ Kjelgaard 1982, pp. 1772–1773. ^ "High hopes." Flight International, 15 March 2005. ^ "Hindustan Aeronautics Limited - Helicopter Division Bangalore: Brief History." HAL, Retrieved: 20 November 2016. ^ "Cheetal." Hindustan Aeronautics Limited, Retrieved: 30 November 2015. ^ a b Mathews, Neelam. "HAL’s Cheetal Meets Indian Army’s Urgent Needs." AIN Online, 1 March 2013. ^ "Army, HAL sign Rs 300 cr deal for 20 Cheetal choppers." Business Standard, 21 February 2013. ^ ""FAI Record ID #754 Altitude without payload. Class E-1 (Helicopters), turbine." Archived 2013-12-03 at the Wayback Machine "FAI Record ID #753 - subclass." Archived 2016-03-04 at the Wayback Machine "FAI Record ID #11657 - Absolute." Archived 2015-12-08 at the Wayback Machine Fédération Aéronautique Internationale (FAI). Retrieved: 21 September 2014. ^ Randall Padfield, R. (1992). "Chapter 8 Autorotation". Learning to Fly Helicopters. McGraw-Hill Professional. p. 151. ISBN 0-07-157724-6. Retrieved 4 November 2010. ^ ""FAI Record ID #788 - Altitude without payload. Class E-1c (Helicopters: take off weight 1000 to 1750 kg), turbine." Fédération Aéronautique Internationale (FAI). Retrieved: 21 September 2014. ^ Kjelgaard 1982, p. 1774. ^ "The EU Code of Conduct fails to prevent French Helicopters being produced under licence in India and transferred to Nepal." Amnesty International, September 2004. ^ a b c Chant 2014, p. 348. ^ Rao, Radhakrishna (15 July 2009). "Indian report slams performance of HAL's Dhruv helicopter". Flight International. ^ Matthews, Neehlam, "Spares Unavailability Threatens India’s Aging Helo Fleet." AIN Online, 14 September 2012. ^ "'Siachen Pioneers' bets on Cheetal helicopters." Brahmand.com, 17 August 2016. ^ Anantha, Krishnan M. "Army turns to HAL for Lancer supply." Times of India, 3 January 2001. ^ "Lancer." HAL, Retrieved: 18 November 2016. ^ "First Flight of the HAL Cheetah Powered by Turbomeca's TM 333 2M2 Engine" Turbomeca, 6 February 2003. ^ "Afghan air force receives Cheetal helicopters". flightglobal.com. 28 April 2015. Retrieved 28 April 2015. ^ a b c d e f "World Air Forces 2013" (PDF). Flightglobal Insight. 2013. Retrieved 14 March 2013. ^ "World Air Forces 1987 pg. 40". flightglobal.com. Retrieved 14 March 2013. ^ "World Air Forces 1987 pg. 38". flightglobal.com. Retrieved 14 March 2013. ^ "National Gendarmerie SA315". Retrieved 14 March 2013. ^ "World Air Forces 2001 pg. 38". flightglobal.com. Retrieved 14 March 2013. ^ "Ejercito de chile Alouette II". Retrieved 12 March 2013. ^ a b "World Air Forces 1987 pg. 51". Retrieved 2013-03-14. ^ "World Air Forces 1987 pg. 60". flightglobal.com. Retrieved 14 March 2013. ^ "World Air Forces 1987 pg. 73". flightglobal.com. Retrieved 14 March 2013. ^ "World Air Forces 2011 (pdf)" (PDF). flightglobal.com. Retrieved 14 March 2013. ^ "World Air Forces 1987 pg. 77". flightglobal.com. Retrieved 14 March 2013. ^ Taylor 1982, pp. 50–51.